There are so many wonderful places that I get to go as a Saratoga Springs wedding photographer. The places people can get ready in the city for their wedding are manifold. There is a huge variety of places where people can have a Saratoga Springs NY wedding. They range from old inn weddings to modern country club weddings. And with the connection to the Adirondack mountains, there is a lot for your wedding party and your wedding guests to do! Amanda and Paul’s wedding at the Batcheller Mansion Inn showed their guests and family a great time. As a small and intimate Saratoga wedding all of the spaces within the inn were active for the wedding. With a ceremony in the large front parlor guests may be seated close to you and may hear everything that is happening. Tables scattered all over the downstairs creates a relaxed setting which doesn’t feel like a traditional banquet hall. People can be seated in more of a restaurant like setting in smaller groups. This makes for a great Saratoga wedding seating arrangement. Many photos can be created on the grounds of a Batcheller Mansion Inn wedding. Or we can venture just a few steps nearby for Congress park wedding photos. 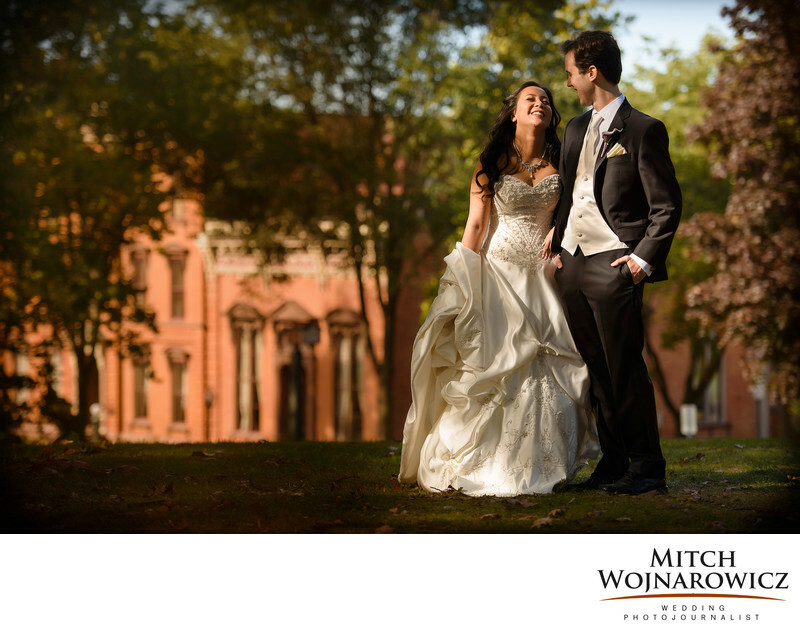 A top Saratoga Springs wedding photographer will know all of the best locations in Saratoga for wedding photos. On the front steps and near the main entrance of the inn are great spots for wedding photos in Saratoga. I love to allow couples to roam these areas as I make relaxed wedding portraits for them. Their guests are well taken care of so the couple gets to have a few minutes alone and some quiet time together as we make some different wedding portraits. As a top Saratoga wedding photojournalist my main focus is on making candid and spontaneous wedding photos. However, I do love making great wedding couple’s photos. But, these don’t have to take up hours. And I make different couples wedding photos instead of the traditional stiff and posed type. We’ll find a great quiet place. You won’t be posed and directed to death into some unnatural position. So look for a top Saratoga wedding photojournalist like me who can help create great wedding photos for you. You’ll have wonderful images the help you relive your wedding day. The guiding principal of the way I work is that it is about moments and not just poses. Anybody can pose a bunch of wedding photos. You want so much more than that for your Saratoga Springs NY wedding. Contact Me Today to talk about your Saratoga Springs wedding! Keywords: congress park (9), saratoga springs (66).